As part of the world wide Scout movement Cub Scouts have their own uniform. Cub Scouts wear a blue uniform shirt with yellow highlight on the collar and sleeves together with navy blue pants or shorts and a belt. They also wear the blue and black 1st / 14th Brighton Sea Scouts scarf, a woggle and badges. The uniform may be worn before the Cub Scout is "invested" or becomes a member, but the scarf and woggle will only be presented to them at their investiture ceremony and cannot be worn until then. Cub Scouts are "Sun Smart" and need to wear a broad rimmed hat or something similar when participating in any outdoor activities. For most meetings at the Scout Hall and excursions the uniform will be worn. Your Cub section leader will let you know if there are activities, such as one where you might get dirty, where you will wear "mufti" or casual clothes. 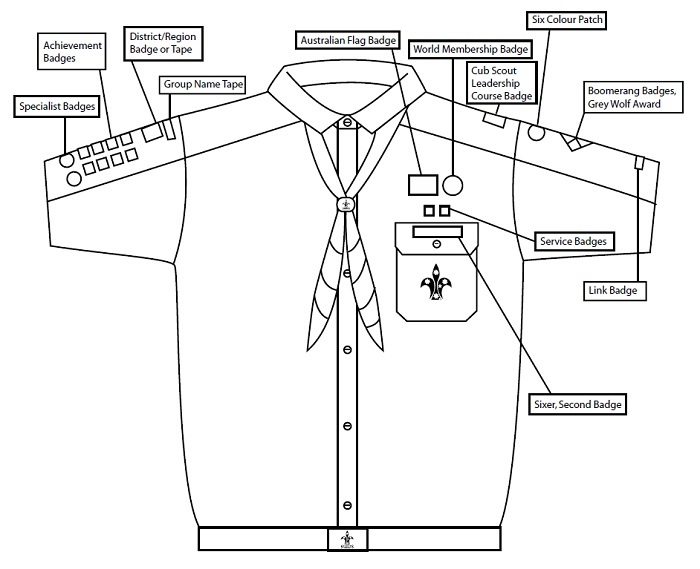 All badges need to be sewn onto the Cub Scouts shirt in specific locations. The diagram below shows the correct placement. 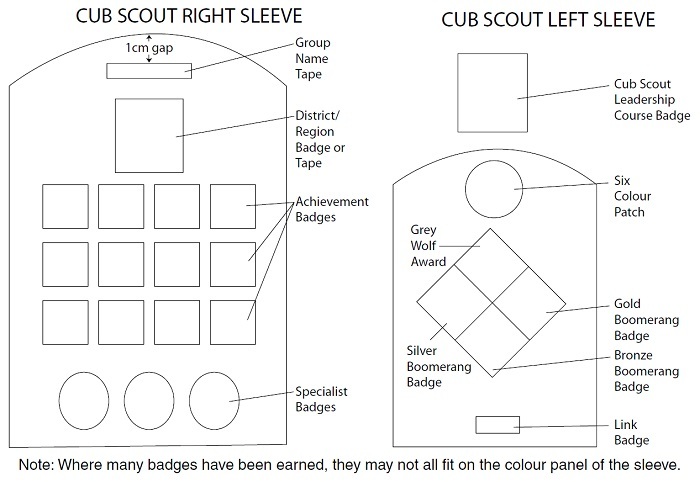 The major components of the Cub Scout Award Scheme are the Bronze, Silver and Gold Boomerang badges. To earn each of these badges, Cub Scouts must complete at least ten challenges (from 14 challenge areas) under the guidance of Leaders. Cub Scouts can set challenges for themselves to earn Achievement Badges from the areas of Arts and Literature, Nature, Science and Technology, Sports and Recreation, and Our World. There are also a number of Special Interest badges. 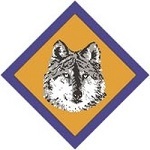 The ultimate badge for Cub Scouts is the Grey Wolf Award. This can only be attained by earning a certain number of badges from the other levels of the scheme as well as completing several additional challenges. The Bronze Boomerang is the first part of the Cub Scouts journey through the Cub Scout Award Scheme. To achieve the Bronze Boomerang Award you need to complete 10 of the 14 challenge areas. Challenges 1 to 7 must be completed but you can choose any three from the challenges numbered 8 to 14. Challenges may be completed in any order, except for number 7 - Promise and Law - which must be completed last and be signed off by your Cub Scout Leader. If you join Cub Scouts around 9 years of age, you will probably start your journey through the Cub Scout Award Scheme with the Silver Boomerang. However, if you joined earlier you would probably have completed your Bronze Boomerang already. The tasks in this part of the award are more challenging, but build on the skills Cub Scouts have already learned. To achieve the Silver Boomerang Award you will need to complete 10 of the 14 set challenges. Challenges 1 to 7 must be completed but you can choose any three from the challenges numbered 8 to 14. You may do the challenges in any order, except for number 7 - Promise and Law - which must be completed last and be signed off by your Cub Scout Leader. If you join Cub Scouts around 10 years of age, you will probably start your journey through the Cub Scout Award Scheme with the Gold Boomerang. However, if you joined earlier you would probably have completed both your Bronze and Silver Boomerangs already. The tasks in this part of the award are more challenging, but build on the skills you have already learned. To achieve the Gold Boomerang Award you will need to complete 10 of the 14 set challenges. Challenges 1 to 7 must be completed but you can choose any three from the challenges numbered 8 to 14. You may do the tasks in any order, except for number 7 - Promise and Law - which must be completed last and be signed off by your Cub Scout Leader. 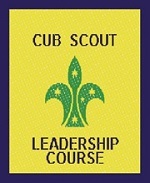 Cub Scouts who are nominated by a Leader may attend the Cub Scout Leadership Course for current and potential Sixers and Seconds. The aim of this course is to provide suitable skills in leadership, problem-solving, challenges and Pack Councils to Cub Scouts who may be appointed to leadership roles within their Packs. 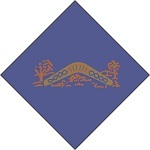 (1) Hold a Gold Boomerang badge, (2) Participate in a minimum of four outdoor activities, (3) Attend two Pack Councils in the previous 12 months, (4) Complete four Level 2 Achievement badges (one from each category), (5) Complete one Special Interest badge, (6) Develop and present a resource for the Six or Pack based on the Cub Scout’s understanding of The Jungle Book.